Thanks! Unfortunately it's about 40 years "too new" . Besides it looks like that shirt is split in front to the hem, like a modern one. thanks, this is a very nice draft. Do you know, if there is adraft or the sleeves`? Posaune, his book is rather simple and short. Here is the whole book. A number of shirts and sleeve drafts. The draft I'm using conventionally has the side seams and CF line vertical, as shown by the black lines. I drew the pattern this way, then measured the existing amount of width at the waist. I decided to add 6" more (3" per half) and split it into three equal parts; an inch at each side seam and angling the CF line forward 1" at the waist. This allows the front to be cut on the fold as is typical of the era. Below the waist, I continued the seams vertically since the hip measure is similar to the chest. Additional overall length will make the side seams correspond to the sleeve length (not shown). What about extra length that will be needed to go over the belly? I could cut the pattern at the waist line and tilt the upper part back to give some extra length. Is there a guideline for how much is necessary? I would cut across on chest line, to make the increase in length to go over the belly. Redraw CF line which also gives you an increase in width at the waist and an increase in width at the hem. To reduce some of the excess at the hem, you could cut along the bib line shoulder to the the circled area, cut up from the hem to the curcled area but not through. overlap at the pattern at the hem. This opens up the pattern along the bib seam. (transferring a dart) Now you have a dart pointing to the belly from the shoulder. The bib needs to come to the waist. if it is shorter, then you are removing some of the needed waist width for corpulence. You may still need to adjust the side seams too, in order to make a large enough increase at the waist. You will also have some gain for gathers or pleating below the bib at CF. your pattern would look like this. It puts one side of the seam on more of a bias. 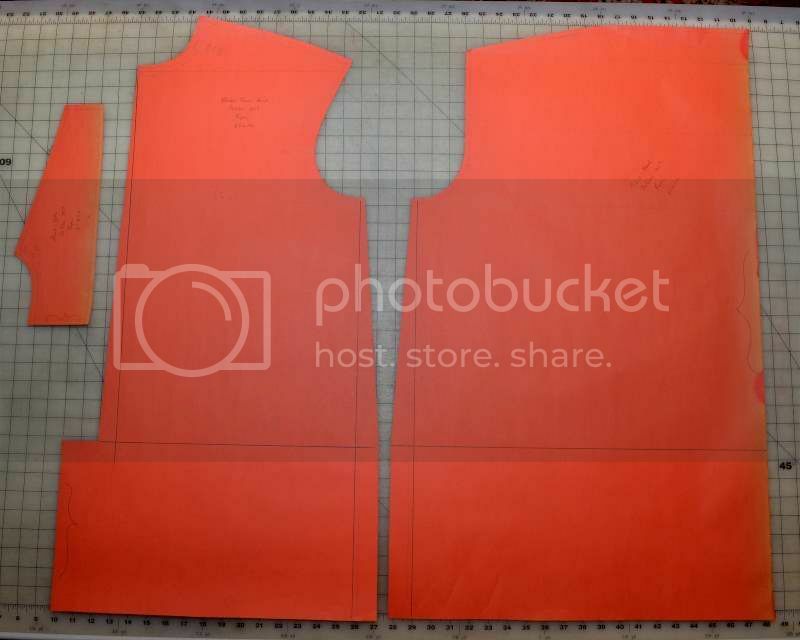 another option is to cut along the bottom edge of the bib seamline to the circled area, cut up from the hem as before and fold over at the hem which will open out a dart along the horizontal bib seam. now you have a short dart pointing towards the belly. Once you place the body of the shirt on the straight grain at CF, the bib seam goes off on the bias anyway. My experience with older shirts includes the "Missouri River Boatman's Shirt from the Folkware collection. My impression is that that pattern just about covers men's day shirts from about Elizabeth the First to the late eighteenth century, or nineteenth c. if you lived on the Missouri river. All sins of figure were accommodated by gathering at the neck. This pattern has only straight lines, with all shaping obtained by gathering as you noted. Even the neckhole starts as a straight slash across the (one-piece) body. By the 1860's, such primitive things were being superseded in America by an abundant supply of cheap, ready-to-wear "French fitted" shirts, which had various degrees of shaping in the chest and sleeves, and sometimes even a yoke. But what about married boatmen ? Actually, if you don't mind a small diversion from the topic. I had wondered if the change in shirt was in some way related to industrialization and the increasing use of cotton over linen. The older shirts were apparently mostly made of linen. I bet cotton was more adaptable than linen in the development of more curved profiles. I think the square cut shirt had to do more with not wasting any of the fabric. Some of the linen was extraordinarily finely woven, but access to it as with many things depended on how much you could afford to oay. Industrialization in general was the impetus fot many changes. Affordable ready mades, where once most shirts were made at home, communication- fashion changes, fabric changes in cost or availability, change trickled down eventually. Great discussion of the changes in shirts over the time frame and a compilation of historical patterns, drafts and period references. Another is Cut My Cote. This is a wee book put out by the Royal Ontario Museum if I recall correctly. Yes. That's where I found the 1859 draft by DeVere.